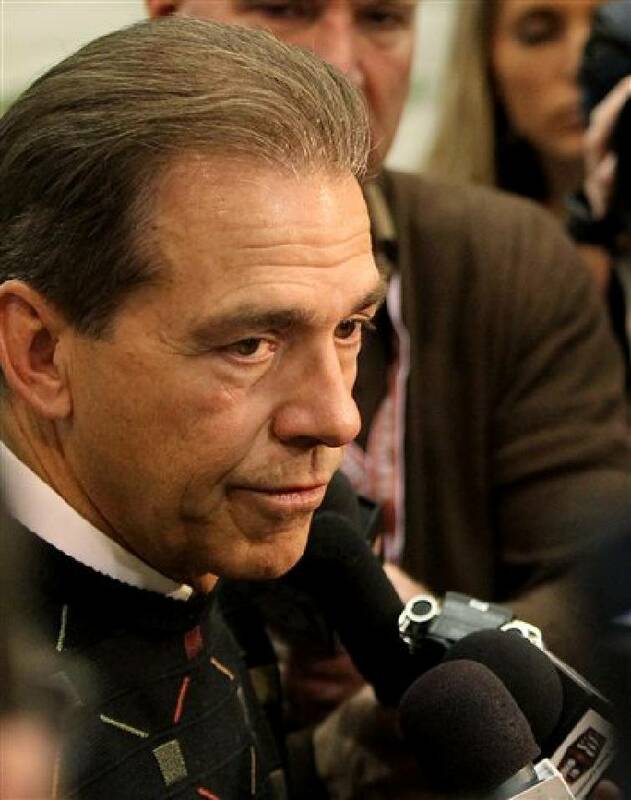 Alabama coach Nick Saban talks with media during Pro Day at the University of Alabama in Tuscaloosa, Ala. It's been just nine weeks since Alabama football coach Nick Saban hoisted another crystal ball after his Crimson Tide bludgeoned Notre Dame at the BCS championship game in Miami. Alabama's title was its third in four seasons -- a feat not even Bear Bryant accomplished -- and AJ McCarron became the first Crimson Tide starting quarterback to win two national crowns. McCarron was among several players asked after that game if Alabama had established a dynasty, but he wasn't about to talk in that regard. Not with a senior year remaining. "You're trying to get me in trouble," he said, smiling. "You need to ask our guys who are leaving. The younger guys aren't going to use that. Coach Saban is like my dad, and I know his thought process. "If the older guys say it, I guess they can say it." The Crimson Tide are trying to become the first Bowl Subdivision team to win three consecutive national titles and four in a five-year stretch, but first things first. Spring practice starts today in Tuscaloosa, and three more practices will transpire next week before players take off for spring break. Alabama will resume April 1, and its A-Day game is set for April 20 on ESPN2.